Since I am moving in just a little over a month, I realized that I had a good bit of canned goods to use up. I will only be purchasing canned items as I need them, no need to stock up! The less I have to move the better. Anyways, I decided to use up some of the canned beans today by making a Southwest-Style 3 Bean Chili. 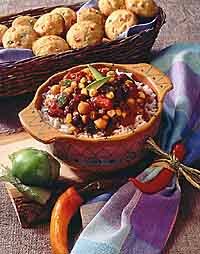 I absolutely love chili – any time of year! I tend to make it fairly regularly. Not only is it delicious and filling, it’s so easy to make and there’s so many ways to make it! I don’t have exact measurements to my recipe, so ala Rachael Ray (*puke*) I eye ball everything I put in. Note: I didn’t put any garlic or garlic powder in, because I am actually slightly allergic to garlic. It’s a tragedy, I know! But you should if you like it and can eat it! Saute pepper and onion until softened, then add ground beef, cook until browned. Add seasonings. Stir. Add diced tomatoes & paste. Stir. Let sit to simmer for a little bit (5 minutes or so). Add beans & corn. Stir. Add sugar if you want it. Stir. Let sit to simmer 20-30 minutes, stirring occasionally. Serve & enjoy! Add your favorite shredded cheese or sour cream on top. If you wish your chili to be hotter, add some Tabasco sauce, chipotle peppers, jalapeno, or cayenne for a kick. Whatever floats your boat. I wanted a milder chili today so none of that for me. Tags: beans, chili, corn, ground beef, Recipes, seasonings. Bookmark the permalink.